One of the ideas I got from my new ‘modernist’ friends is to prepare vegetable fondant sous-vide. 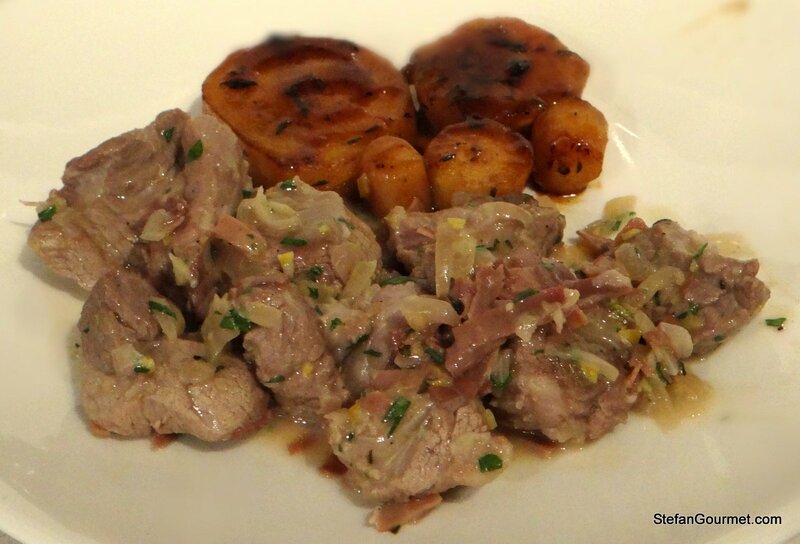 I tried it with parsnips as a side for the lamb with our Easter dinner, and it turned out great. I had never heard of vegetable fondant, but it seems to be very popular in restaurants in the UK. 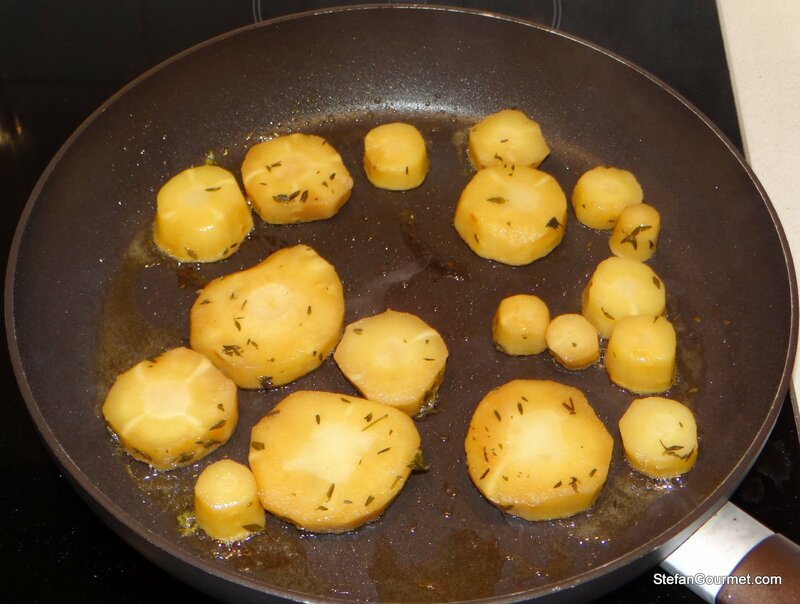 Root vegetables or potatoes are browned in fat and subsequently cooked in stock. It is relatively simple to do, but quite tasty as both the stock and the browning will add some nice flavor to the vegetable. This technique can also be used for potatoes, celeriac, sweet potatoes, carrots, etc. It can be cooked without sous-vide as well, but the nice thing about the sous-vide preparation that it is easier to cook the vegetables perfectly tender with some bite to them, neither undercooked or overcooked, and that you need less stock to cook them. With conventional cooking on the stove or in the oven, you’d need enough stock to almost cover the vegetables. With sous-vide you only need enough to coat them. 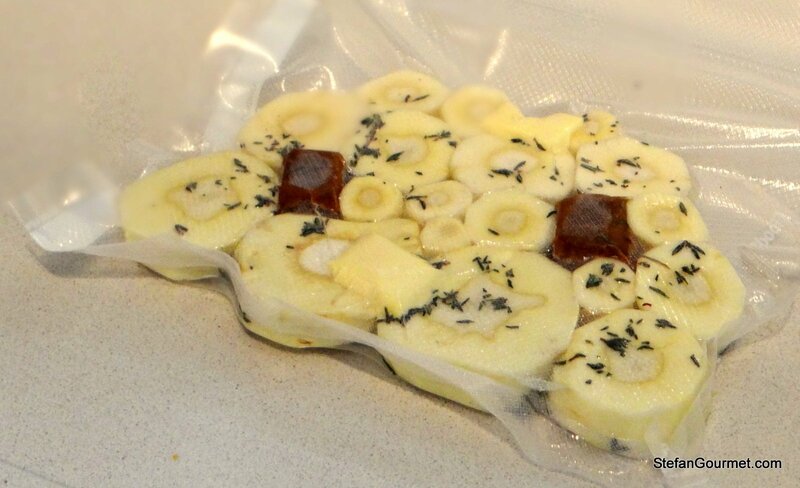 If you don’t own a chamber vacuum sealer, you must freeze the stock in cubes or use ziploc pouches to be able to vacuum seal the vegetables with the stock. 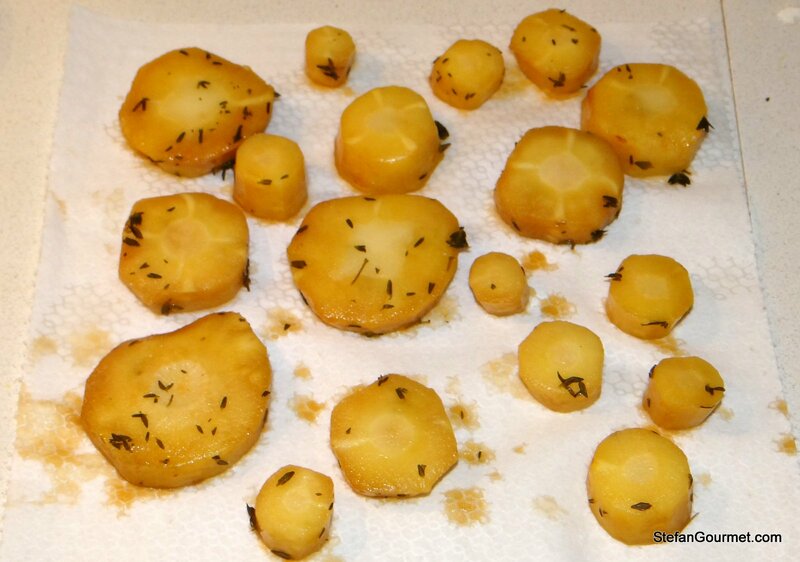 I opted to cook the parsnips until they were quite soft, so the browning added some nice flavor but they didn’t get crispy. If you like them crispy, cook them for a shorter time and/or at a slightly lower temperature (83C/180F) and do not pour the sauce over them. 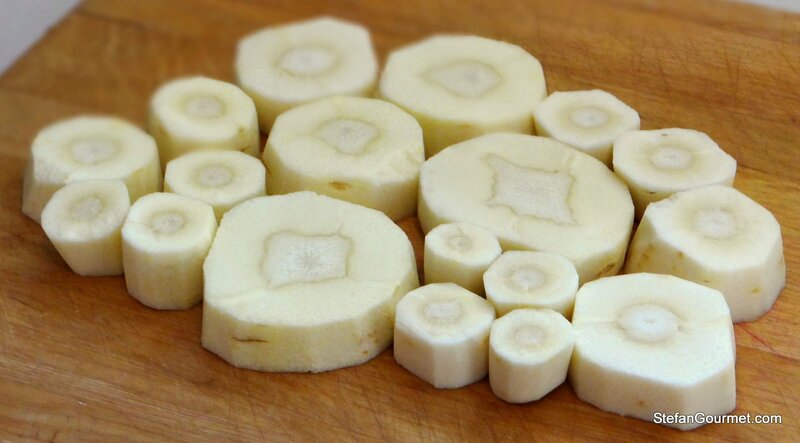 Peel the parsnips and slice into thick rounds. Vacuum seal the parsnip rounds with the stock and thyme. Cook sous-vide for 45-90 minutes at 85C/185F. 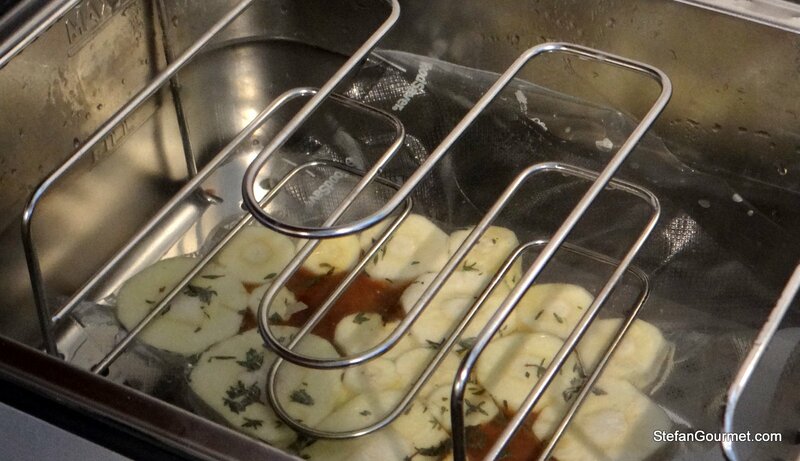 If needed, you can keep the parsnips warm or reheat them in the water bath while the meat is cooking sous-vide. At such a temperature, in this case 57C/135F for the lamb, the parsnips will stay warm but won’t ‘cook’ any further. Remove the parnip from the bag, reserving the stock left in the bag. Pat the parsnip dry with paper towels. 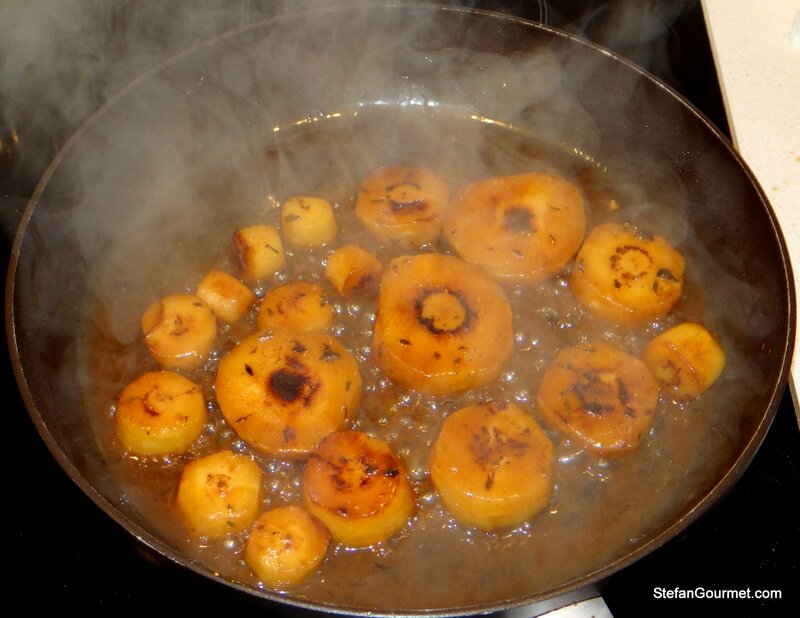 Heat some (clarified) butter in a non-stick frying pan and brown the parsnip on both sides over high heat. If you’d like to serve them crispy, remove them from the pan. 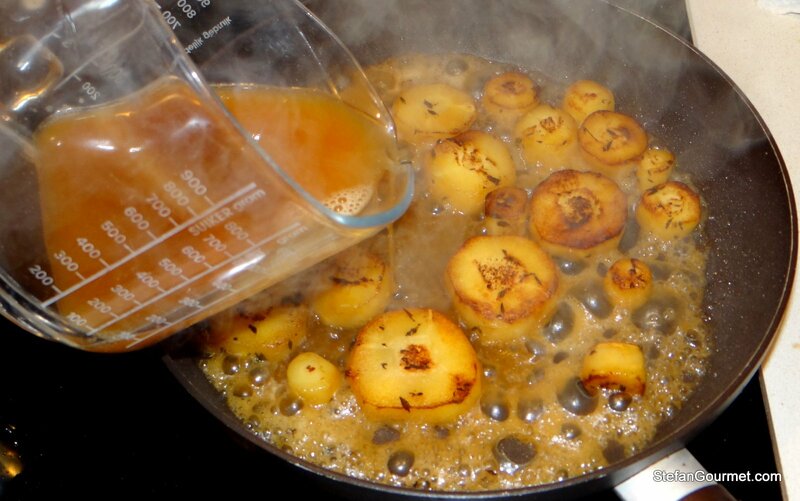 Deglaze the pan with the reserved juices from the bag, diluted with some water. Cook over high heat, basting the parsnip with the sauce, until the sauce has thickened. Serve the parsnips as a side with a bit of the sauce. I want to try this with sweet potato! Thanks! I bet that’ll be great! Have you tried the glazed carrot sous vide recipe from Serious Eats (Alton Brown) in the US? http://www.seriouseats.com/2010/06/how-to-sous-vide-carrots-vegetables.html Its quite similar. They taste absolutely great, really intensify the carrot flavour. I also like that they will store once sous vide cooked for a few days, I’ve doen so with no problem. 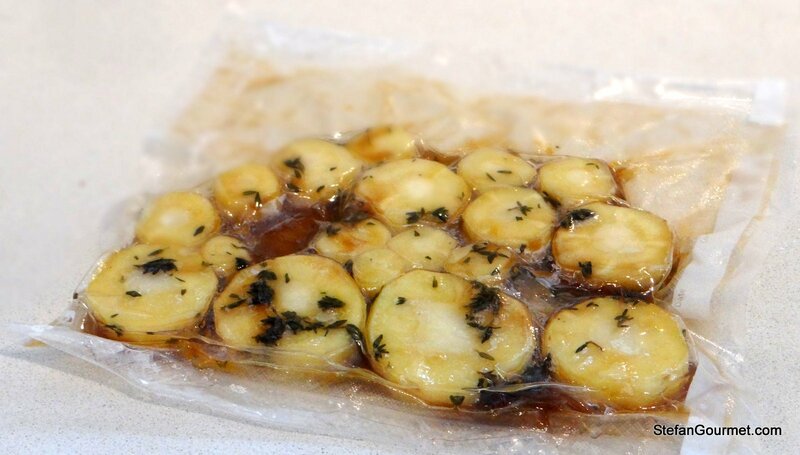 Then when you finish them in the pan you need no other ingredients, just dump the sous vide bag contents into a pan and cook till the liquid evaporates. 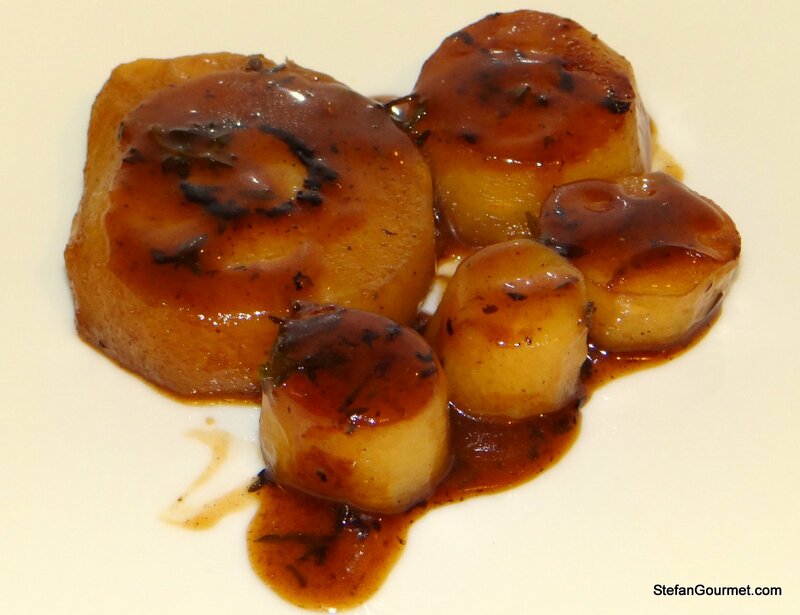 I served these with a sous vide chicken ballotine and it worked very well. I have tried glazed carrots sous-vide, but not that exact recipe. I had some trouble getting the carrots cooked (they seemed to take forever) and I also had some trouble with the glaze, which is why I haven’t posted about this yet. So perhaps I should have a look at that recipe — thanks for the tip! What an interesting idea … I think I might try simmering some parsnips or carrots in my master sauce briefly and the follow up as you did after the sous-vide (using a little of the master sauce as the ‘stock’). It would be a double benefit as the master sauce would get a little bonus flavoring as well! Sounds like a great idea! It is best to cut them such that they have a nice flat surface for browning. The parsnip cooked this way comes out even sweeter than usual. You never fail to amaze with the things you sous-vide! Very interesting Stefan. I’m with trixfred30 above. And, yes, it is a compliment. Thanks, John, also for confirming my suspicion that vegetable fondant is not very well known in the US. Now I wish I had a sous-vide machine. Haven’t heard the term veg fondant but I’ve had this prep before though no sous-vide. Looks delicious. I’m sure you can do something quite similar without sous-vide, which is not the case for some of the meat and fish recipes for sous-vide.